Located in the beautiful 'Bear Paw' resort. Amenities include an Olympic size pool, basketball area, children's playground, tennis court, and a full service marina. Boat rentals are available. This resort in located on Lake Hiwassee. Over 163 miles of shoreline. Great year round fishing. This cabin is nine years old and beautifully furnished by a local interior decorator. The home consists of a main floor with 1 queen bedroom, full bath, kitchen, dining area, living room with gas fireplace and deck with gas grill. Upper level is the master suite with king size bed and sitting area along with full bath. Lower level has 2 queen bedrooms and an additional living room and full bath and washer/dryer. TV/DVDs on all levels. FREE Wi-Fi and FREE long distance calling (US) at cabin. Everything is included right down to the spices on the kitchen counter. NO PETS NO EXCEPTIONS. When deciding if our cabin is adequate for your needs please DO NOT consider using the sofas for sleeping arrangements (even for kids). 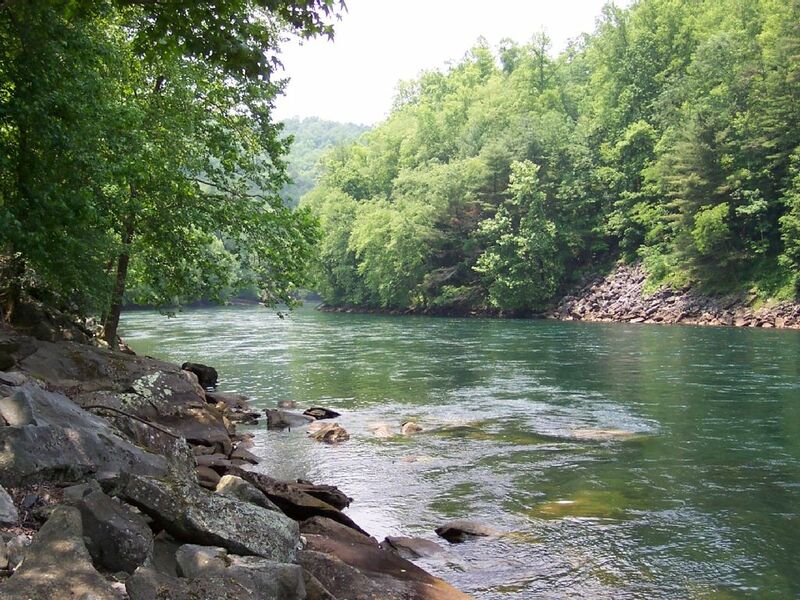 One stay at 'Hiwassee Hideaway at Bear Paw' and you will be hooked on the beautiful mountains of North Carolina forever. Approximately 35 minutes from new Cherokee Casino in Murphy, NC. I truly believe you will find that our cabin has everything and more than you will need during your stay. I have tried to think of everything imaginable to stock our home with so you can feel like it is your home away from home. In April 2009 we installed an 8 person hot tub for our guests enjoyment. FREE Wi-Fi and FREE Long Distance calling (US) at cabin. I want our guests to feel free to enjoy our home as if it is their home. For the past few years we have stayed here. Its like a home away from home for my family and I. The cabin is so beautiful and so peaceful. We look forward to vacations here every year. We could imagine staying anywhere else. See you next year for sure! We enjoyed our stay. Cabin is clean and beautifully decorated. The set up was perfect for our 4 couples. Owners are friendly and accommodating. We even had four deer visit during our stay. We will choose this cabin again. We enjoyed staying in this beautiful home that had an excellent view of the mountains! We enjoyed staying in this beautiful home. We had everything we needed during our stay. Absolutely beautiful view of the mountains! Quiet & Comfortable with a Beautiful view! This was the perfect place to spend time with my family. 7 of us stayed for 5 days and it was gloriously quiet & beautiful but felt like being at home. We will definitely get together here again. Our group enjoyed the hot tub very much and the beds were comfortable. My only suggestion would be to stop by the grocery store on the way in. Our cabin is located in the Southwest corner of North Carolina only 1 1/2 hours from Chattanooga and 2 hours from Atlanta and within an easy drive of Knoxville, Nashville and Asheville. Whitewater rafting is less than 45 minutes away. 2 public golf courses are close by for your enjoyment. Gambling located in nearby Cherokee, NC and the Biltmore Estate in Asheville is only a short day trip away. Train trips and the Bavarian city of Helen, GA are close by. You could find somewhere to go every day of your stay or just enjoy the pool and surrounding area of Bear Paw. There is a full service marina located in Bear Paw that rents pontoon boats for you to enjoy the 163+ miles of shoreline on Lake Hiwassee. Great fishing & swimming in the lake. No need to worry about alligators here- just the wonderful cool water. Vacations are for relaxing and you will definitely feel relaxed staying at our 'Hiwassee Hideaway ' nestled in the beautiful resort area of Bear Paw. Enjoyment guaranteed! $695.00-$795.00 per week & applicable tax of 10.75%. Cleaning fee included in weekly rate. $125.00 per night with 3 night minimum. $85.00 cleaning fee will be charged on any rentals less than 4 nights. Please call for rate. Seasonal rates and specials available. $200.00 security deposit due at time of booking. Balance due 3 weeks before arrival. Rentals from Memorial Day weekend thru Labor Day weekend begin on a Saturday.